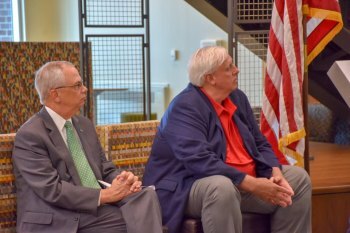 Governor Jim Justice held a press conference at Marshall University to discuss the National Guard’s partnership with the Huntington Police Department over the past 6 months and to announce 3 grants that will be implemented throughout the state. Since December’s, the National Guard has supplied additional technical and analytical support to the Huntington Police Department so that officers have more flexibility to patrol neighborhoods and investigate crimes. Mayor Steve Williams, Huntington Police Chief Hank Dial, Marshall University President Jerome Gilbert and other representatives all spoke about the about the actions that have been implemented and the success that has occurred as a result. According to Chief Dial, violent crime fell 24.9 percent during the first six months of this year compared to the last six months this of 2017, while property crime decreased 21 percent. Williams, Huntington Police Chief Hank Dial, Marshall University President Jerome Gilbert and other representatives all spoke about the about the actions that have been implemented and the success that has occurred as a result. According to Chief Dial, violent crime fell 24.9 percent during the first six months of this year compared to the last six mo this of 2017, while property crime decreased 21 percent.